Freelancers fill gaps in your teams’ existing expertise and enable you to achieve a better end result. It’s almost always worthwhile to hire someone specialized in a particular area than trying to do everything yourself. Depending on the production, you may need additional specialties like special effects, prosthetics, animation, and more. From there, each video production entails an intricate conversation related to the creative framework, the budget, and the support each department needs to function smoothly. Generally speaking, you hire a department head at a minimum, and supporting crew members underneath them as needed. In most scenarios, more crew members supporting a department head means faster setups, smoother transitions on set, and a quicker pace overall. In the most literal of ways, one person isn’t doubling the time it takes to do something by going back and forth carrying equipment from point A to point B – he or she has an assistant helping out. On the other hand, more crew members and freelancers means more money spent from the budget. Finding the right balance between budget and departmental needs is the key to determining the number of freelancers for a production. In general, producers are smart to follow a top-down approach when allocating budget and resources. First, determine the department heads you need based on the scope of the project. Then, we recommend having in-depth conversations about requirements with those department heads. For example, say a video script includes a lot of shots and camera movements, but not a lot of props or work to be done to dress the set. It would not make sense to allocate the same budget and staff to your camera and Grip and Electric (G&E) departments as to your art department. You’d be shortchanging your camera and G&E teams, and overkill on the art department. The note on budget is an important one to keep in mind. For department heads, they may understandably lean on the side of preferring more support and more crew members. However, in producing videos for businesses, it’s imperative to view the project as a whole in terms of the desired end result. Will there be graphics? Are there elements in post-production that hold more weight in the video? Does the client value sleek cinematography over acting, or good acting and simple camera setups? In that regard, it’s smart to walk backwards with your department heads to determine the ideal scenario of support and resources across all teams. For example, if a DP wants two camera assistants and six G&E crew members, but your budget is limited, a compromise might be best. 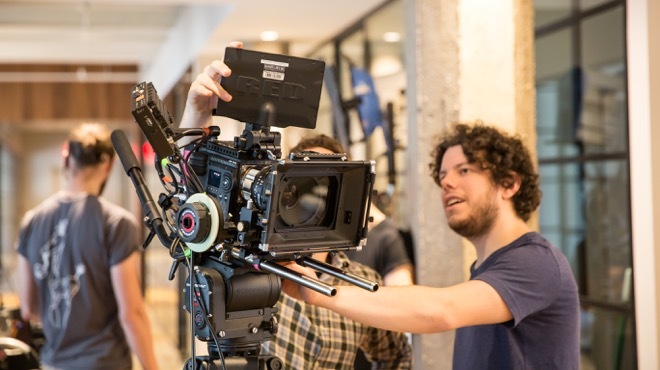 You could hire two camera assistants, four G&E crew members, and two Production Assistants that specifically help everyone in those departments. That way, the production is more economical, but you aren’t necessarily losing out on efficiency in terms of manpower. Of course, it’s important to not stifle a production. If the schedule is aggressive, it’s not wise to leave a DP without a lot of support and expect them to both capture amazing footage and move incredibly quickly. The basic foundation of hiring freelancers is simple communication of three things – role, rate, and date. Many times, simply referring to the role is enough for a freelancer. 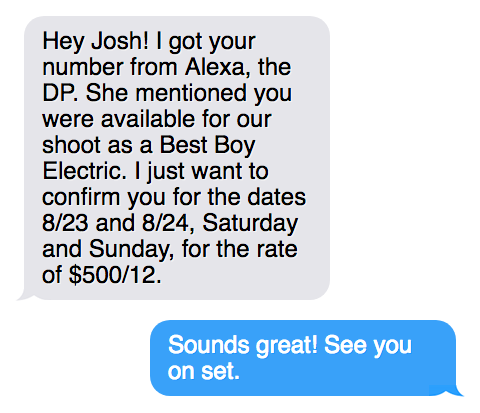 For instance, a Best Boy Electric (BBE) and a Producer both know the expectation of a BBE on a crew. They don’t need to have a conversation related to what types of clamps the BBE will use. If a Producer reaches out and mentions that role, the rate, and the date from the start, in total clarity and transparency, that freelancer enters the production knowing that the boundaries of his or her job are rock solid for the dates committed. Compared to normal hiring processes, hiring freelancers is often absurdly quick and informal. It might just be a 10 minute conversation, or a few text messages. We reach out to freelancers, confirm details, and expect them on set. Following the principles of clarity and transparency help smooth that out. Importantly, it conveys the impression of a professional working environment on a production. That same conversation should take place with every crew member, down to each individual PA. Although brief, it mirrors the same environment as a conversation with HR when accepting a job in an office environment. The terms, pay, and specific role are clearly stated upfront. That type of attitude is pivotal for a production where everything has to go completely right. A client doesn’t want to hear that a production fell apart because freelancers and crew members were upset. 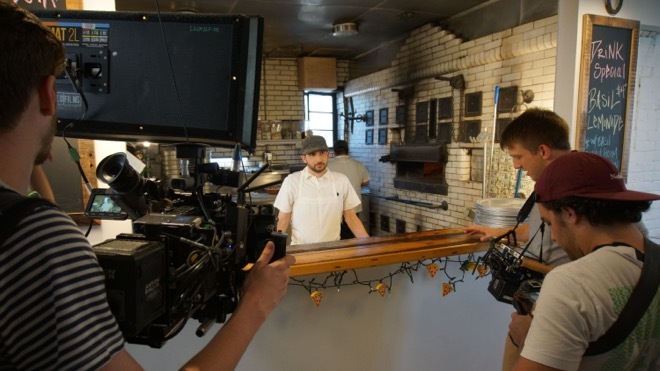 A client wants to show up on set for a video produced for their business and immediately feel like operations at hand are buttoned up and running smoothly. The number one rule with hiring freelancers is clarity and transparency. Freelancers want to feel that the world they’re stepping into is the one they’ll encounter, consistently, for the rest of the production. In some scenarios, we need to elaborate on details beyond role, rate, and pay. Those conversations are usually specific to department heads. Sometimes, they also apply to other people who will play a large role in defining the video production. Some freelancers involved in a video production will end up investing a lot of time and energy into the production. Whether they’re communicating amongst the team, communicating with clients, or engaged in the creative vision of the production, their effort can go above and beyond. Accordingly, they will want to feel that the terms of their work is adequately reflected in some type of formal agreement. This is where a deal memo comes in. It’s essentially a contract for a professional that reflects the specific terms of a production. The best example of the need for planning and drafting deal memos is directors. When it comes to business video, directors speak with clients to tap into their vision, and tailor a video to their needs. They communicate their best understanding of a project to the department heads working underneath them, including the director of photography, art director, and more. In that capacity, they regularly plan to commit time beyond a certain amount of shoot days. They prep, scout, speak on conference calls, and meet up with department heads on their own time. They also put a lot of effort into the post-production of a video to ensure the end result reflects their vision. For that reason, their deal memo has to be one that expansively and efficiently encompasses their commitment and leaves them feeling confident in their rate. Many times, directors forgo a specific “day rate” on a project and negotiate a rate for the whole project. Though a “rate” might be bid per shoot days, these directors know they will be on preproduction meetings and investing extra time. Therefore, they’ll want to feel like the rate as a whole encompasses all of that effort. In addition to locking a rate, a deal memo also details the specific duties of the freelancer. For example, a deal memo for a director would stipulate their creative responsibilities as well as their day-to-day job requirements. As mentioned above, directors are almost always on pre-production meetings with clients to walk them through the vision of the shoot. In videos made for formal business contracts, every step is communicated. Following this, deal memos may specify these types of more formal commitments, such as the pre-production meeting, for the director. Some crew members and freelancers might be on the same page just by mentioning the role name. However, significant roles, like directors, frequently require more elaboration in the deal memo to outline their responsibilities. Ultimately, the deal memo should clearly define the freelancer’s role, their time commitment, and their rate. Most producers and production companies can point to a familiar network of freelancers they hire on a regular basis. They may even have an informal relationship wherein both parties can chat over dates and already trust each other on rates and roles. With other freelancers, being clear and transparent means encouraging the type of atmosphere that’s going to bring the best out of freelancers. Within stable bounds, with role, rate, and dates defined, they’ll bring the professionalism every business video production needs. When freelancers are happy, quite frequently, the end result of the production is a client that is happy. 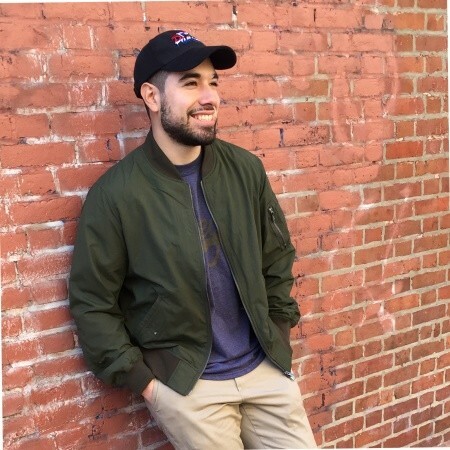 Chris Kubik is an Executive Producer & Partner at Melty Cone Video, a video production company specializing in commercials, corporate videos and branded videos, located in New York City.